Chances are you’ve probably enjoyed a glass or two of orange juice as a part of your morning routine or with a big Sunday breakfast, and haven’t thought much of it other than “Hey, this is delicious,” and perhaps some vague notions about vitamin C.
But did you know that orange juice actually has some major health benefits? In fact, orange juice is considered one of the healthiest beverages you can enjoy, after water, and oranges have been eaten for their health benefits for thousands of years. The benefits of orange juice are plentiful, and include boosting immune function and detoxing the body. Orange juice contains almost all of the same nutrients and vitamins as an orange itself, which means that drinking the juice is a great way to quickly enjoy many health benefits with your morning breakfast. The only thing orange juice is missing is the fiber content found in the fruit, but it has just about everything else. Of course, you may have heard that orange juice isn’t good for you, but this is because many store-bought brands are heavily processed and contain additives. Frozen and packaged orange juice is unhealthy, so natural, freshly squeezed juice is the better option. If you want to know more about its specific benefits, then the first place to look is orange juice’s nutritional information. Orange juice is a rich source of many vitamins and minerals. In particular, it contains a high amount of vitamin C. In one eight-ounce glass of orange juice, there are 82 milligrams of vitamin C—that’s 137% of the daily recommended amount, meaning you can get all the vitamin C you need through one drink. Orange juice also contains other vitamins, such as thiamin, folate, niacin, vitamin A, and vitamin B6, and it’s also a good source of minerals such as potassium and calcium. Orange juice is low in calories, fat, and cholesterol, and like all fruit juices, it contains sugar: 21 grams per cup. However, as with most fruits, the health benefits outweigh that small amount of sugar. So, what exactly are the benefits of orange juice in the morning? Here are some of the top health benefits you can get from drinking even one glass of orange juice each day. Vitamin C has a powerful effect on the immune system, and orange juice is loaded with vitamin C. Vitamin C is an antioxidant and reduces the harmful effects of free radicals in the body. As well, the body uses vitamin C to help improve immune function and regulation. Drinking orange juice can help you fight off sickness, viruses, and even the flu. The kidneys help detoxify the body from harmful elements. Vitamin A helps improve kidney function, and orange juice is a good source of vitamin A. Drinking orange juice can help detox your body. Like vitamin C, vitamin A is also an antioxidant that can fight free radicals. Antioxidants have many benefits, but another thing they help with is in preventing cancer. In fact, antioxidants help stop the formation of cancerous cells; some specific antioxidants have been linked to slowing tumor growth. This means that a cup of orange juice per day could be a good choice if you’re at risk for cancer. Orange juice has a range of benefits for digestion. Drinking orange juice can help improve the function of your intestines cure stomach ulcers, and prevent bloating, plus it can also help with diarrhea, constipation, and gas. Orange juice also has anti-inflammatory properties, and research has found that these properties can help improve insulin resistance, promote cardiovascular health, and reduce the risk of developing diabetes or heart disease. For people with inflammatory diseases, orange juice can be part of a healthy diet to avoid aggravating the symptoms. Folate, or vitamin B9, has many important functions in the body. One of these is to help build red blood cells, which improve the flow of blood and keep the organs oxygenated. 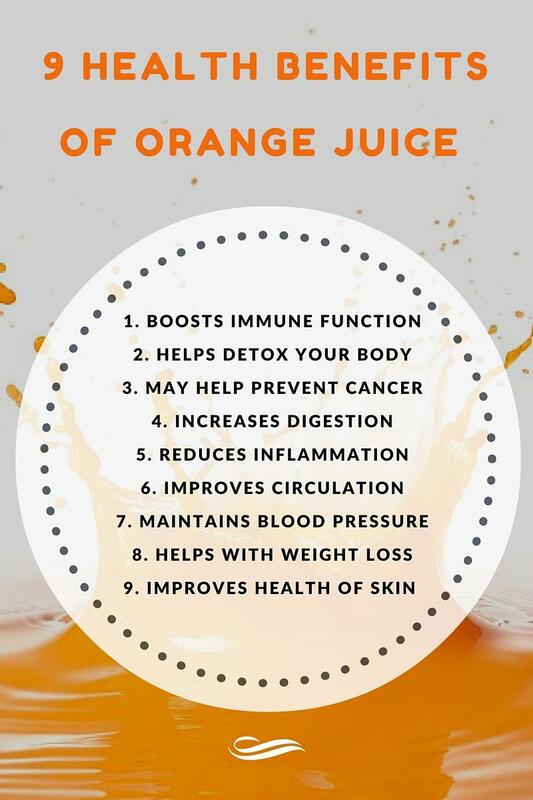 Orange juice is a rich source of folate, so by drinking it, you can improve your blood circulation as well as the health and functioning of many of the body’s organs. There are many health benefits of orange juice for men, especially when it comes to blood pressure. Orange juice contains magnesium, which has been found to lower blood pressure, but the benefits don’t stop there. Orange juice contains specific antioxidants that can improve the functioning of blood vessels and have been linked to further reductions in blood pressure. If you want to know what the benefits of orange juice after a workout are, then you should know that it can actually help with weight loss. Citrus fruits are loaded with antioxidants, which can help when it comes to trimming down. Along with your protein shake and vegetable smoothie, consider adding a glass of orange juice to your workout routine. You may have heard of skin creams containing antioxidants that can help fight aging and reduce wrinkles. Well, orange juice has similar benefits, because oranges have these same antioxidants. The benefits of orange juice for the skin include fighting free radicals, preventing wrinkles, and helping your skin look younger. How Much Orange Juice Should You Have? So, you know there are benefits to orange juice, but is there such a thing as too much? Orange juice does contain some sugar, so drinking too much can be unhealthy. One glass of orange juice has about 21 grams of sugar, and while that’s less than a typical can of soda, it means that depending on the rest of your diet, you might want to be careful. If your diet is healthy and low in sugar, then having one glass of orange juice each day should be fine. However, if you’re already eating sugary foods, then a cup of orange juice can add to the unhealthy amounts of sugar you’re eating, in which case, stick to one glass, and cut down on sweets and desserts too. Still, it beats a can of Coke, right? One glass of orange juice has about 21 grams of sugar. If your diet is healthy and low in sugar, then having a glass of orange juice each day should be fine. Since packaged and frozen juices are unhealthy because of the additives and extra sugar, how do you go about getting natural, freshly squeezed orange juice? The best way is to make it yourself, and luckily, this is an easy task: use a juicer, which will squeeze the juice out of fruit. The great thing about a juicer is that you can easily add other healthy fruits and vegetables to your juice, such as carrots, you can create a delicious orange-carrot juice. Take one medium-sized orange and four carrots, peel them, chop them into small enough pieces to fit in the juicer, and let it work its magic. However, if you don’t have a juicer, you can still easily make your own orange juice; all you need are some oranges, a cup, a knife, and your muscles. First, lightly knock the oranges against a counter or hard surface, to loosen them up a bit. Next, cut each of the oranges in half, and then squeeze the halves over a glass. Orange juice and pulp will collect into the glass, and if you don’t like pulp, you can always run the juice through a strainer before drinking. You can also use a small kitchen accessory called a citrus reamer to help with squeezing the juice out of these fruits. While juicers can be quite expensive and will use some electricity, a citrus reamer is a simple handheld device that shouldn’t cost more than $10. Grab one and show those oranges who’s boss! Are There Any Side Effects to Orange Juice? Orange juice has a relatively high amount of sugar and carbohydrates, so it can cause some side effects when consumed in excess. Orange juice is considered a low-glycemic food, which means that if you stick to a moderate amount, it shouldn’t cause any spikes in energy or blood sugar level. But too much orange juice can have a high-glycemic impact on your body. Your blood sugar level can spike and drop and your energy level may also rise and crash. This is particularly concerning for people who have diabetes or are obese. While the antioxidants in orange juice can help with losing weight, too much orange juice may cause weight gain, because the sugar will contribute to obesity in the same way that candies or chocolate bars do. 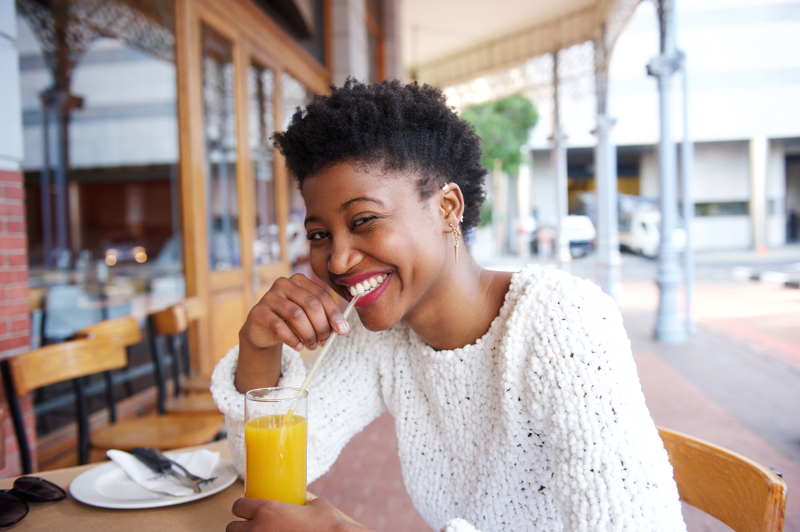 So it’s best to stick to one glass—it’s all you need to get all the health benefits of orange juice! 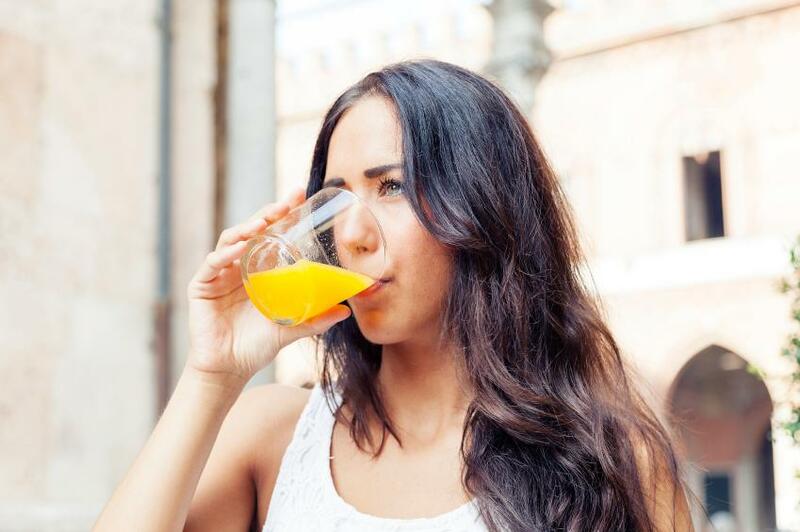 “The Benefits of Drinking Orange Juice Everyday,” Step to Health web site; http://steptohealth.com/benefits-drinking-orange-juice-everyday/, last accessed April 26, 2016. “Carrot-Orange Juice,” Eating Well web site; http://www.eatingwell.com/recipes/carrot_orange_juice, last accessed April 26, 2016. “Fresh Orange Juice,” All Recipes web site; http://allrecipes.com/recipe/89229/fresh-orange-juice/, last accessed April 26, 2016. “Health Benefits of Orange Juice,” Organic Facts web site; https://www.organicfacts.net/health-benefits/beverage/orange-juice.html, last accessed April 26, 2016. Jacob, A., “Side Effects of Too Much Orange Juice,” Livestrong web site, July 18, 2011; http://www.livestrong.com/article/495611-side-effects-of-too-much-orange-juice/, last accessed April 26, 2016. “Top 10 Health Benefits of Orange Juice,” Style Craze web site, December 3, 2015; http://www.stylecraze.com/articles/health-benefits-of-orange-juice/, last accessed April 26, 2016.